“Where there’s a will, there’s a way”, but what if there isn’t a will? Will, in the inheritance sense, that is. 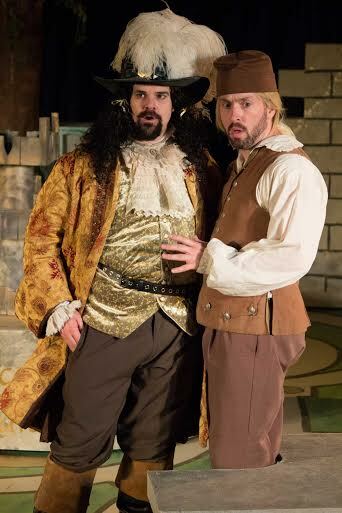 That’s the premise for the madcap, witty, lightning-paced adaptationc The Heir Apparent, currently on stage at the Ivory Theatre as presented by St. Louis Shakespeare. With tons of energy, clever staging and a ridiculously funny story, this production is a comic treat. 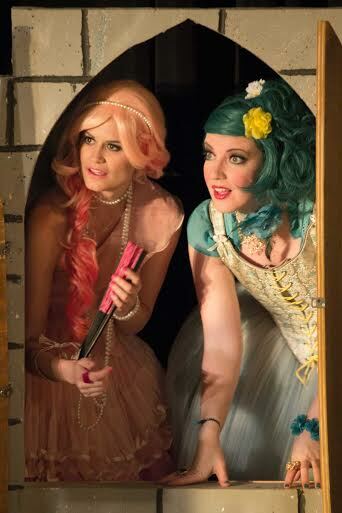 The comically convoluted story is set in 18th Century Paris. A poor, lovestruck young man, Eraste (Scott McDonald) wants to marry his beloved Isabelle (Jeannita Perkins), who also wants to marry him. The problem is that Isbelle’s mother, the socially ambitious Madame Argante (Margeau Steinau) doesn’t care if her daughter’s in love. She wants Isabelle to marry for money, and Eraste doesn’t have any. He does, however, have a wealthy uncle, Geronte (Shane Signorino) who is in poor health and who hasn’t yet written his will. Since Madame Argante has told Eraste that he can only marry Isabelle if he is made sole heir in Geronte’s will, Eraste is on the verge of despair until servant Crispin (Isaiah DiLorenzo) and Geronte’s mistreated maid Lisette (Britteny Henry) offer their assistance and a series of convoluted plots ensues. That’s the basic set-up, but there’s a whole lot going on here, with a host of plot twists, sight gags, and witty banter as the story moves along to its zany conclusion. This is a crazy play, with so much going on that it wouldn’t be too difficult to lose track of the plot, except that director Donna Northcott has staged this production extremely well, and the cast members all seem to be having a great time. The seven member ensemble is extremely well-cast, led by DiLorenzo as the scheming Crispin and Henry as his snarky girlfriend and accomplice, Lisette. Signorino is also gleefully surly as Geronte, and Steineau is hilariously haughty Madame Argante. McDonald and Perkins make a sweetly goofy couple as Eraste and Isabelle, and Anthony Winninger steals many a scene as Geronte’s lawyer, Scruple, whose diminutive stature requries Winninger to spend the entire performance walking around on his knees. There are lots of rhymes, mile-a-minute dialogue, and physical comedy that is handled extremely well by this excellent cast. The whimsical nature of the show is well-reflected in Chuck Winning’s colorful set and Michelle Siler’s delightfully wacky costumes. There are also some fun surprises with the set that add to the comedy. Ted Drury’s sound and James Spurlock’s lighting are also excellent, adding to the mood of the produciton. If you want to laugh a lot, see this show. It’s silly, it’s fast-moving, and it’s full of frantic energy. It calls to mind this company’s previous successes with last year’s Wild Oats and 2014’s The Liar. The Heir Apparent is another comic triumph for St. Louis Shakespeare. St. Louis Shakespeare is presenting The Heir Apparent at the Ivory Theatre until September 4, 2016. 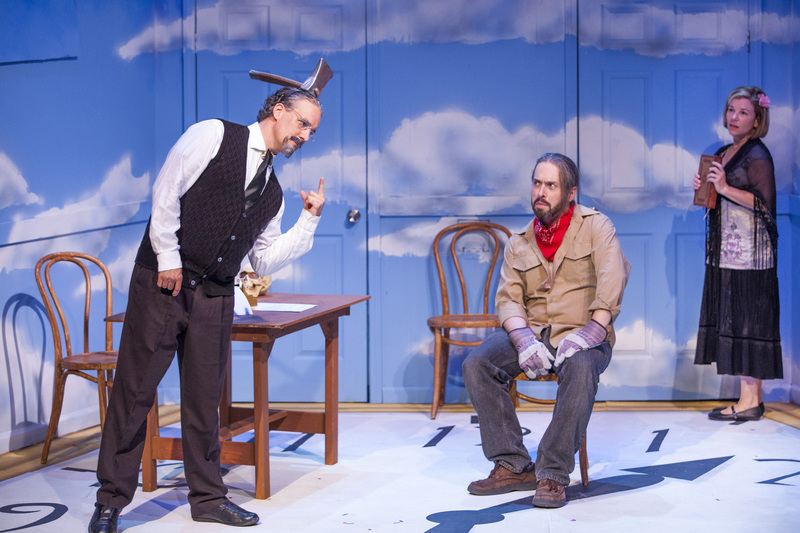 St. Louis Actors’ Studio’s eighth season is called “The Best Medicine”, emphasizing comedy of various types. Their season opener, All In the Timing, is a collection of short plays by David Ives, focusing on the more bizarre kind of comedy. Simply put, it’s hilarious, with a striking design concept and consistently excellent performances from the four-person cast. All In the Timing consists of six short plays that are unrelated in plot, although some of them share similar themes or structure, and the element of time is prominent to some degree in all of them. A troupe of four actors (Emily Baker, Michelle Hand, Ben Ritchie and Shaun Sheley) play various roles throughout the evening. The first and last segments–“Sure Thing” and “Variations On the Death of Trotsky”–unfold in a similar format, as a situation is introduced and different possible outcomes are explored, with the divergences signified by the ringing of a bell. Some of the plays show more realistic situations–such as “Sure Thing”, which depicts various versions of the first meeting of Bill (Ritchie) and Betty (Baker) in a coffee shop; and “The Universal Language”, in which a man named Don (Sheley) advertises lessons in his invented language and finds and enthusiastic student in initially shy Dawn (Baker). These find their humor in both the quick rhythm of the performances, as well as the winning performances of the cast. They are also notably engaging because of the excellent chemistry between the performers in each segment–particularly Sheley and Baker, who both shine in speaking a hilariously cobbled-together language that’s a mixture of English, other world languages, pop culture references, real people’s names, and a smattering of gibberish. Other segments are more absurd in nature, such as the delightful “Words, Words, Words”, in which three chimpanzees called Swift (Ritchie), Milton (Sheley), and Kafka (Hand) participate in an experiment seeking to explore the much talked-about “infinite monkey theorem” in which monkeys randomly typing will eventually produce Hamlet. This one is particularly entertaining for all the literary references, as well as the winning portrayals of all three performers, who are convincingly chimp-like in their physicality and are delightfully personable in their conversations. For absurdity, there’s also “Philip Glass Buys a Loaf of Bread”, which is exactly what it sounds like, riffing on composer Glass’s reputation for unusual musical stylings. This one is also a notable triumph for lighting designer Patrick Huber and director and sound designer Elizabeth Helman. The timing and pacing of this piece, as well as the atmospheric lighting effects, make this segment memorable. The last two segments continue in the absurdity, as “The Philadelphia” explores a situation in which two men, Mark (Ritchie) and Al (Sheley) and a restaurant waitress (Baker) experience a world in which a person’s everyday situations are compared to a US city–Philadelphia, Los Angeles, Cleveland, etc. It’s an interesting idea, again very well played, and it makes me wonder what a “St. Louis” would be like. The last play, and one of the highlights of the evening, is the aforementioned “Variations On the Death of Trotsky”, in which exiled Russian revolutionary leader Leon Trotsky (Sheley)–who spends the entire play with an axe sticking out of his head–discusses his own 1940 assassination with his wife (Hand), who is reading the story from a 2014 encyclopedia. Various scenarios involving the bewildered Trotsky, his wife, and assassin Ramon (Ritchie) are played out with hilarious and disturbing consequences. This segment is a particularly masterful representation of the show’s title, All In the Timing, since it is all so precisely timed and played to outrageous comic effect by this very strong cast. 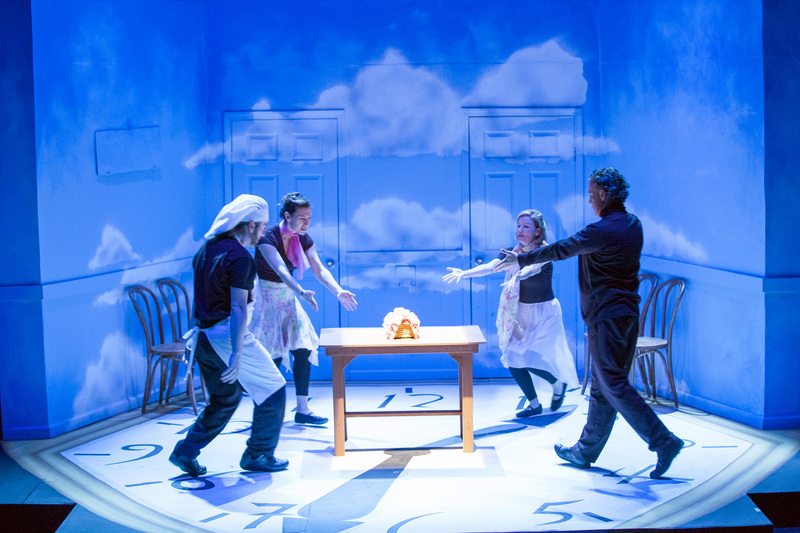 The vignettes are all played out on the same Dali-inspired set, designed by Huber and featuring the famous “melting clock” motif from Persistence of Memory. The costumes and props by Carla Landis Evans are extremely appropriate and memorable, as well, particularly in “Words, Words, Words” and “Trotsky”. The overall theme of time is additionally emphasized by these great technical elements, and particularly that giant, inescapable clock painted on the floor. This is an unquestionably weird production, but there is much wit and wonder in its weirdness. As the title states, the timing is essential, and Helman’s direction and the strong performances of all four cast members help to emphasize that fact. There’s much to think about here, but most importantly, this show is very, very funny. and there was much well-earned laughter from the audience on opening night. It’s a strong kick-off for a promising season.